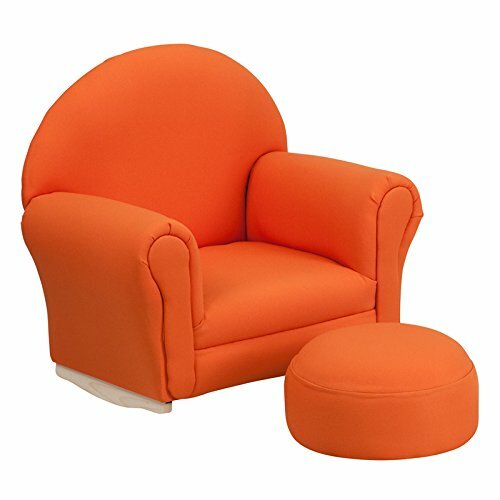 Kids Lounge Seating is a Portable Design including Chair and Footstool Set with Orange Fabric Upholstery and CA117 Fire Retardant Foam as well as Black Bottom Dust Cover. Rocker Base Chair, Footstool Size: 13''W x 13''D x 7''H. 88 lb. Weight Limit, Intended use for Children Ages 3-7. Specifications: Shipping Weight: 20 lbs. ; Seat Size: 12.25''W x 13.5''D; Back Size: 22''W x 14.75''H; Seat Height: 8.5''H; Arm Height From Floor: 14.5''H; Arm Height From Seat: 6.5''H; Overall Width: 23.75''W; Overall Depth: 15.5''D; Overall Height: 21.5''H; Weight Capacity: 88 lbs.